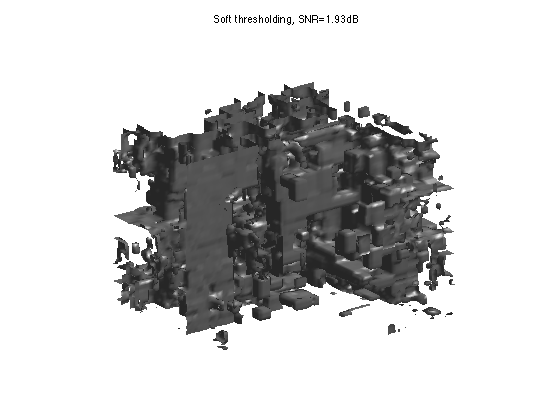 This numerical tour explores volumetric (3D) data processing. For Scilab user (otherwise there is not enough memory). WARNING: you should extend the stack size only ONCE. An isotropic 3D Haar transform recursively extract details wavelet coefficients by performing local averages/differences along the X/Y/Z axis. 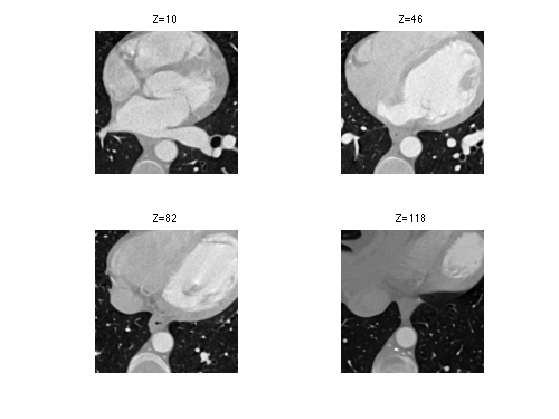 Display a horizontal and vertical slice to see the structure of the coefficients. Exercice 1: (check the solution) Implement the forward wavelet transform by iteratively applying these transform steps to the low pass residual. An approximation is obtained by keeping only the largest coefficients. We threshold the coefficients to perform m-term approximation. Exercice 2: (check the solution) Implement the backward transform to compute an approximation M1 from the coefficients MWT. 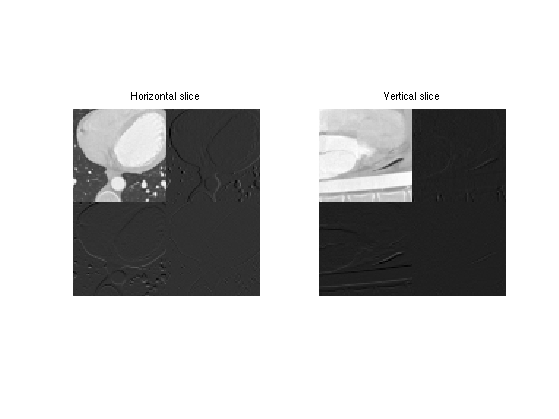 Display the approximation as slices. 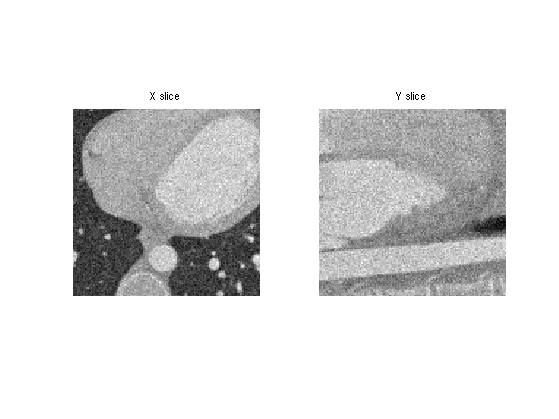 Linear denoising is obtained by low pass filtering. We add a Gaussian noise to the image. Display slices of the noisy data. 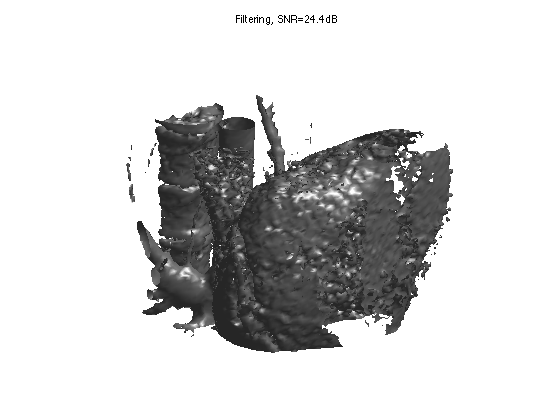 A simple denoising method performs a linear filtering of the data. We build a Gaussian filter of width sigma. 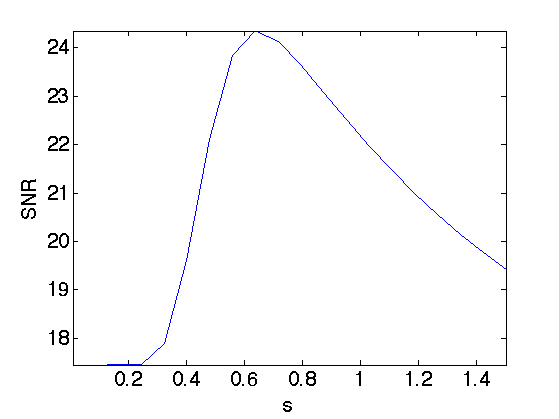 The filtering is computed over the Fourier domain. 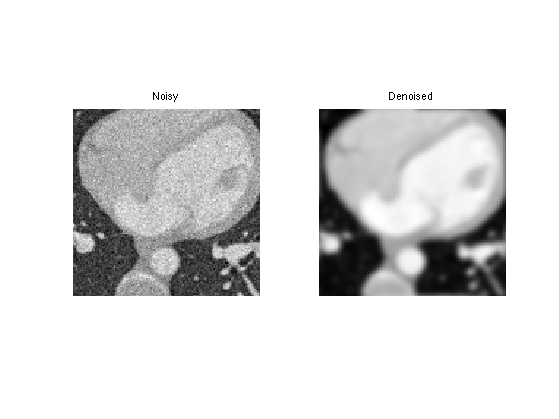 Denoising is obtained by removing small amplitude coefficients that corresponds to noise. 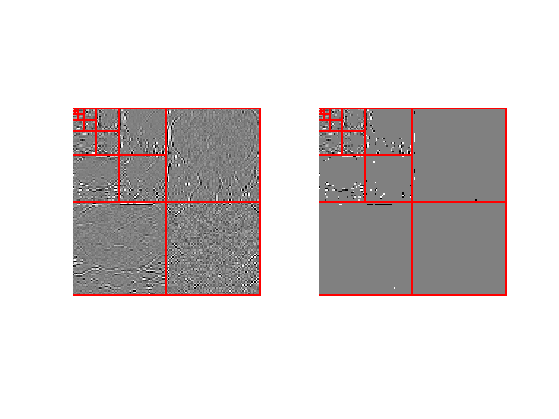 Exercice 4: (check the solution) Perforn Wavelet denoising by thresholding the wavelet coefficients of Mnoisy. 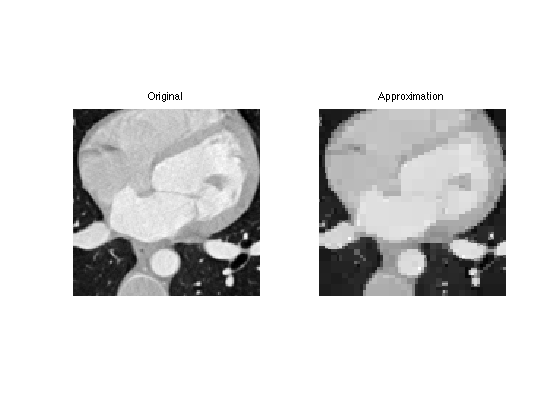 Test both hard thresholding and soft thresholding to determine the optimal threshold and the corresponding SNR. Record the optimal result Mwav. Display denoised iso-surface with optimal soft thresholding. Orthogonal wavelet thresholdings suffers from blocking artifacts. This can be aleviated by performing a cycle spinning denoising, which average the denosing result of translated version of the signal. A typical cycle spinning process is like this. 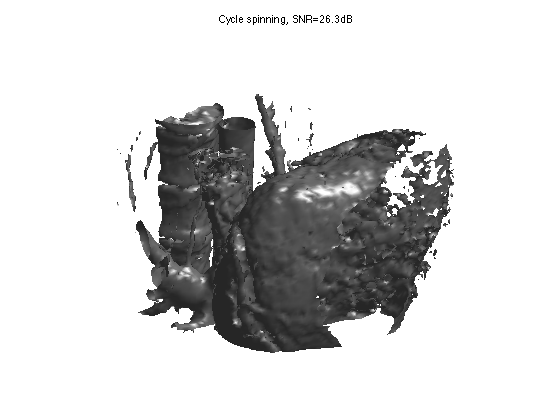 Exercice 5: (check the solution) Implement cycle spinning hard thresholding with T=3*sigma. 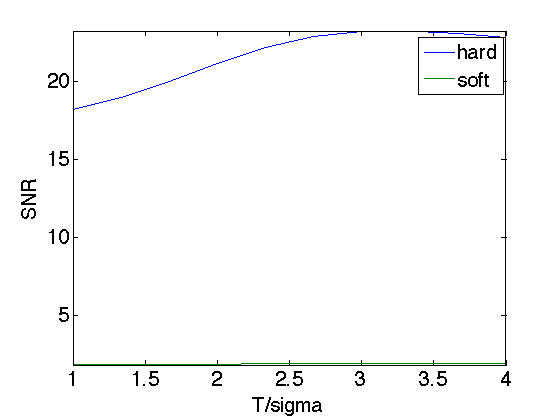 Similarely to the Haar transform, wavelets with more vanishing moments are obtained with filtering and subsampling (pyramidal algorihtm). First we create the filters for 4 vanishing moments. 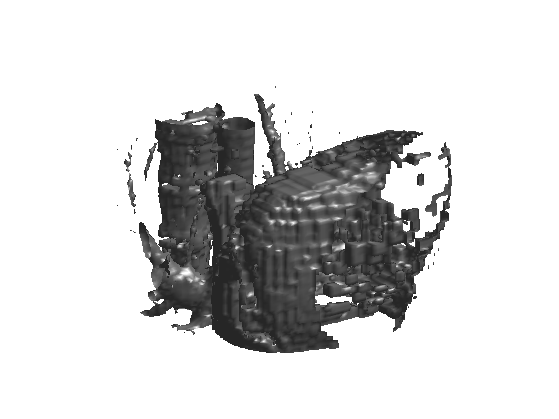 Then we initialize the wavelet transform with the 3D image itself, and set the current scale. We transform by filtering + sub-sampling the low pass residual along the three directions. Exercice 6: (check the solution) Implement the full 3D forward wavelet transform by applying these steps for decaying scales j toward 0. Display the coefficients and thresholded coefficients for one slice. Undo one step of the wavelet transform. Note: subselectdim(A,sel,1) is equivalent to A(sel,:,:) while subselectdim(A,sel,2) is equivalent to A(:,sel,:). Exercice 7: (check the solution) Implement the full 3D backward wavelet transform by applying these steps for increasing scales j. Better denoising results are obtined by thresholding orthogonal wavelet coefficients. Exercice 8: (check the solution) Implement denoising by soft and hard thresholding Daubechies wavelet coefficients. Exercice 9: (check the solution) Implement cycle spinning hard thresholding with Daubechies wavelets with T=3*sigma.